STEPHEN RICKERL / FOR THE SOUTHERN Fountain Bluff encompasses the north end of Big Hill and sits less than one mile from the Mississippi River. Fountain Bluff once served as a ceremonial and burial site for Native Americans in southern Illinois and has numerous petroglyphs. STEPHEN RICKERL / FOR THE SOUTHERN Eric Meade holds an arrowhead found near his home, which is adjacent to Fountain Bluff. 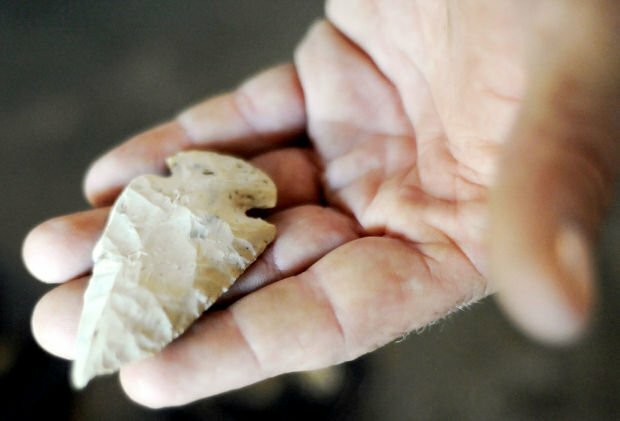 STEPHEN RICKERL / FOR THE SOUTHERN Eric Meade's collection of Native American arrowheads were all found in the fields surrounding Fountain Bluff and on the bluff itself. Meade, who has lived in Gorham most of his life said he has been finding them since he was a kid. STEPHEN RICKERL / FOR THE SOUTHERN Fountain Bluff near Gorham is a site historically significant to southern Illinois. Native Americans used the bluff for ceremonies and as a burial ground. Fountain Bluff at the north end of Big Hill in Jackson County sits less than one mile from the Mississippi River and holds a wealth of significance to Native Americans. The history of Native Americans in Southern Illinois is a complex story that ranges from a thriving civilization circa 1100 to a diseased and dwindling population that by the early 19th century was confined to a reservation less than 2 square miles in area. Despite not having a presence in Southern Illinois since ceding their land in 1832, evidence of a Native American culture rich in history can still be found across the region. Sites such as the Cahokia Mounds, Fountain Bluff, Millstone Bluff, Piney Creek Ravine and Sand Ridge are a few of Southern Illinois' historically significant sites. Centuries before Europeans came to Southern Illinois there was a sizeable Native American population at Cahokia Mounds in present-day Collinsville. The site is a series of earthen mounds that were constructed for religious and ceremonial purposes by a group of Native Americans that archeologists named the Mississippian people. Monks Mound, the largest of all the mounds, occupies more than 17 acres of land and is one of the world's largest earthen structures. Archeologists estimate that the population of Cahokia was 20,000 and that the six-square-mile site was constructed sometime around 1000. Although Cahokia would have been the biggest settlement of the Mississippian people, it wasn't the only one. Cahokia was connected into that whole lower Mississippian culture," said Gray Whaley, associate professor of history at SIU Carbondale. As mysteriously as Cahokia emerged, it was abandoned after reaching its zenith around 1250. By the time Europeans arrived in the region, a tribe called the Illiniwek or Illini was living in the area that would later become Illinois. In fact, Illinois derives its name from Illiniwek. The Illiniwek were a loose confederation of tribes that included the Cahokia, Kaskaskia, Michigamea, Moingwena, Peoria and Tamaroa. It is difficult to identify for certain which tribe was where in Southern Illinois. "Whenever you get into tribal identities, there's always a bit of imposing," said Whaley. The Illini tribes had a cyclical routine tied closely to the changing seasons; they would plant crops in the spring, hunt in the sum-mer, harvest in the fall and then scatter into smaller camps for winter. This routine, along with warring with other tribes and European conquest, meant they were highly mobile and hard to trace his-torically. "It's just fragmented bits of history of scattered groups," said Mike McNerney, an archeologist for American Resources Group in Carbondale. "By the time we began to record their activities they were under such incredible stress from losing their land to three European countries fighting over their land - Spain, England and France and then suffering from disease and alcoholism and all of those things that they were just constantly on the move and their numbers were diminishing all the time. So it was extremely stressful," McNerney said. 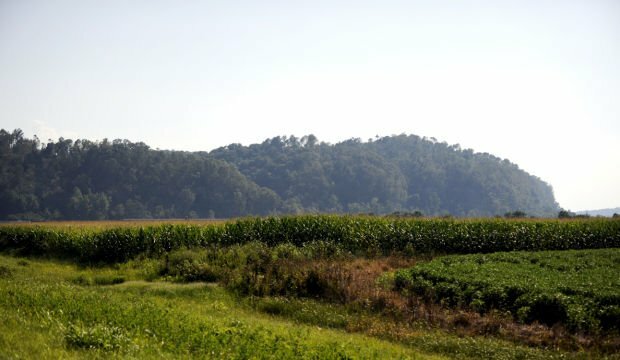 Despite their mobile life ways and the difficulty involved in tracing Native American tribes, there are several sites in Southern Illinois that still illustrate their significance. "On it and all around it are numerous archeological sites," McNerney said. According to Mark Wagner, an archeologist at the Center for Archeological Investigation at SIU, petroglyphs dating from 1000 to 1500 are drawn and carved into the walls at Fountain Bluff. "A lot of the images carved there are for religious reasons," Wagner said. Fountain Bluff sits on privately owned land, but Wagner suggests rock art enthusiasts can view petrogylphs at sites run and protected by the Forest Service and the Department of Natural Resources. Sites such as Mill Stone Bluff in Pope County and Piney Creek Ravine on the Randolph-Jackson county line feature unique petro-glyphs illustrating Native American views of the universe. Wagner explains the east side of Mill Stone Bluff depicts a bird representing the upper world, while the west side, featuring snakes and serpents, represents the under world. Out of all the sites significant to Native Americans in Illinois, none is more inconspicuous than Sand Ridge. It is on this small half-mile by two-mile strip of land in Jackson County that Native Americans spent their final years in Southern Illinois. "Sand Ridge is unique in that it is one of the few places on record to have a Native American settlement, that place we can actually say there were Indians there, that was their designated reservation, and then they were gone," McNerney said. On Aug. 13, 1803, the Kaskaskia tribe ceded their claim to all land in Southern Illinois to the United States. As a result of the treaty, they received 1,280 acres of land in Sand Ridge along the Big Muddy River. They remained at the Sand Ridge reservation until 1832 when surviving members of the Illini again signed a treaty with the United States ceding all their claims to land in Illinois. For signing the treaty, the tribes received 96,000 acres of land in northeast Kansas. After the treaty, all surviving members of the Illini collectively adopted the name Peoria and were moved to Kansas. By 1950, only 439 Native Americans remained out of the 12 tribes that made up the Illini. Even though Native Americans left Southern Illinois in 1832, modern-day Illinoisans are still finding remnants of the Illini civili-zation.